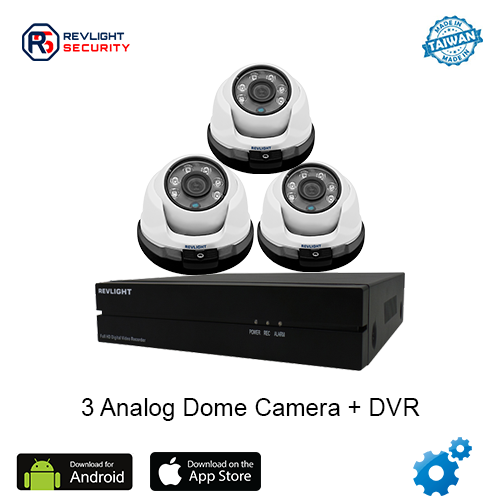 Our 3 Camera DVR Security System Consists of 3 analog camera including one 4 channel dvr system with 1 TB video recording storage, which has 1 year warranty. Protect Your Property With A 3 Camera DVR Security System, Simple and Safe. If you don’t feel safe at home, it can lead to unnecessary stress. Keeping your employees or family safe by installing one of the best HD CCTV Security cameras available just makes sense. Installing a 3 Camera DVR security system is easily done with an adjustable bracket for mounting on either the ceiling or wall. With weatherproof housing and superior HD video with 1080 lines of resolution, this small Analog Camera is extremely effective and offers optimal clarity. 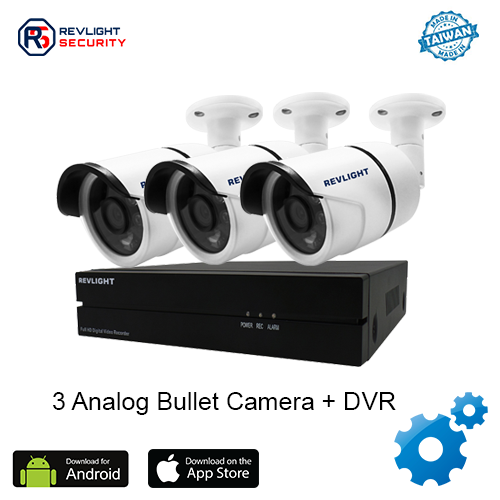 Revlight Security Provides You With The Best High Quality Resolution, HD CCTV Security Camera System. Compatible with standard power/video BC (round) connectors, our analog 2 camera security system with DVR are easy to install. The Digital Video Recorder (DVR) gives you the ability to watch your camera feed from anywhere at anytime through your phone, tablet, or PC. Review past videos at any time with an easy to use DVR viewer app. Your family deserves the safety provided by our 3 camera surveillance system. And you should have the peace of mind that comes with being able to see what is going on when you’re away. Not sure what’s best for you? Just talk to our experts! Call our Revlight Security CCTV Team experts today for a free consultation at +65 6678-6557.